Oh how I love this kid. Any how well these faces portray the ever changing volatility of this kids emotions. He’s always enjoyed a good photo shoot. 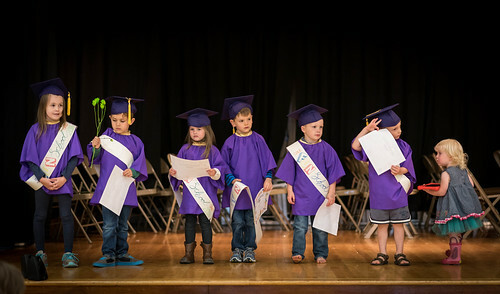 Scotland’s Preschool Graduation- and questions about raising excellent kids. Second year down, who knows how many more to go! 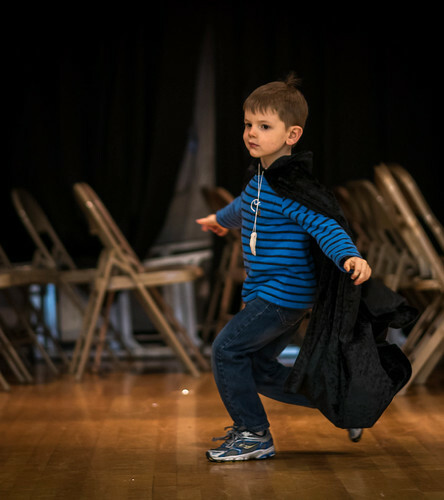 We wrapped up Scotland’s second year of preschool at the end of May. 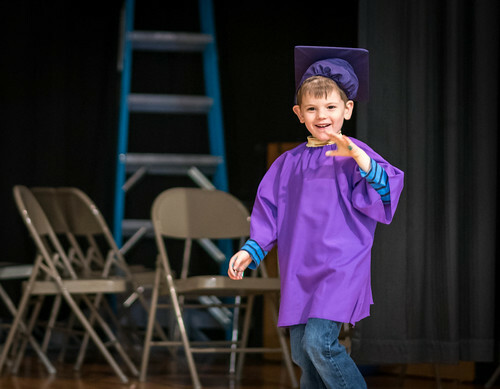 Our final class included a talent show and graduation ceremony. 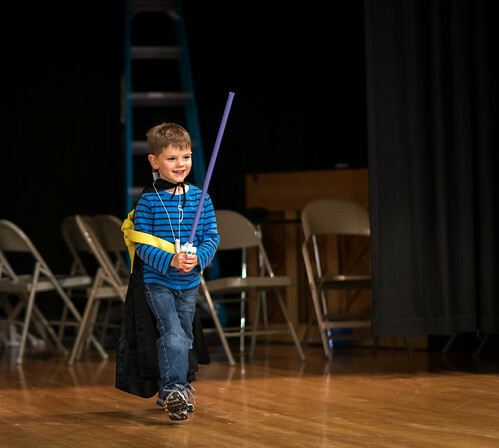 When I asked Scotland what he wanted to do for the talent show he quickly replied “Moves!” And moves he did. 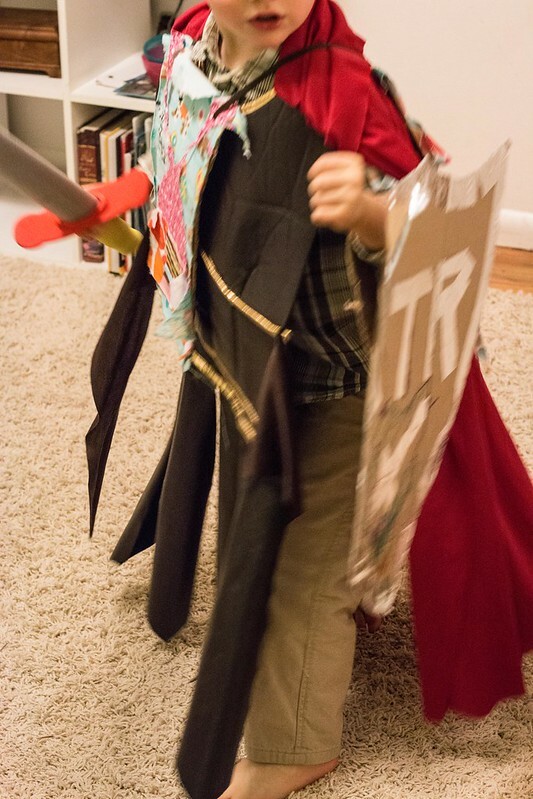 He adorned himself in his self-created dress ups, and chose to perform to music from “The Chronicles of Narnia,” his latest obsession. (He’s listened to the audiobook of “The Lion, the Witch, and the Wardrobe” around ten times.) When it was his turn to perform he walked out with confidence, a wide smile on his face. 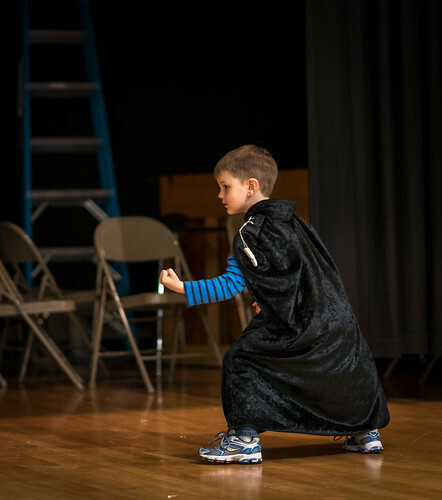 He danced around the stage, doing warrior moves, clearly imagining himself dressed like King Peter from the movie. It made me happy to see him so confident in his creativity. 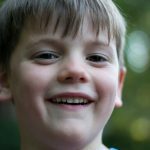 I’ve mentioned this on the blog before, but one of my goals as a parent is to do everything I can to assure my children feels safe and confident in smiling. I’ll never forget watching a primary program and noting that the majority of the kids were trying so hard not to smile. Only a few smiled confidently- as I looked at their parents they had wide grins spread across their faces too- and were the type to wave from the audience at their child. My hope is that as I model smiling, and create an atmosphere of support and joy, I can prevent the trend towards forced seriousness. The first boy to perform was Noah, one of Scotland’s best friends. You’ll likely remember that hey did Tae Kwon Do together. 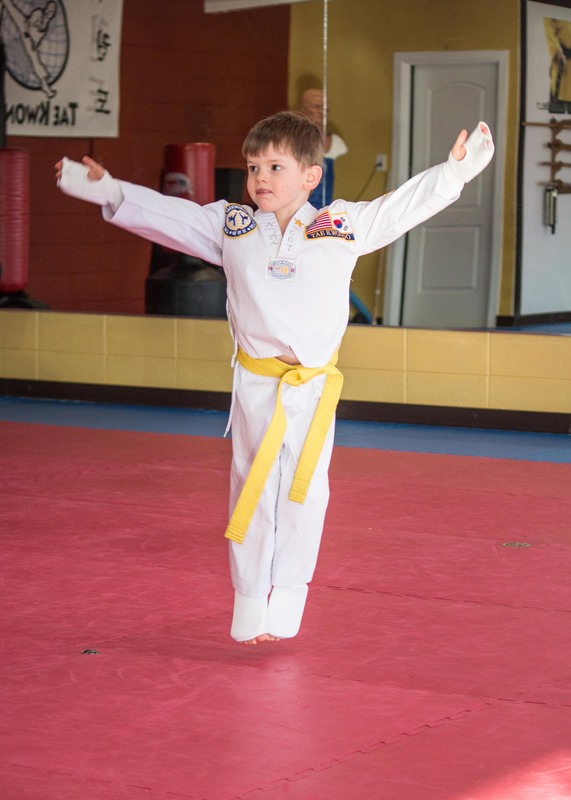 Noah demonstrated his tae kwon do walking motions, and hand motions will skill and precision. I was impressed. Again I wondered if we should have let Scotland quit at the end of March. I composed several posts about this decision in my head, but they never made it to the keyboard. But it was a hard choice and I want to explore my feelings more here. Scotland started Taekwondo, excited, enthusiastic, focused and determined. He went twice a week from September through March. But around December his enthusiasm started to wane. Noting his stress his instructors moved him to an easier class. (A joke of a class where they ran around kicking balloons.) Disappointed in the quality of instruction, I asked that he be moved into a more challenging class. He was, and the teachers were strict with him, often calling him out in class for loosing focus, or not following instructions properly. One a few occasions their public rebuke brought him to tears (though both times he wiped them away with a hard face, while continuing his hand motions- determined not to let anyone see.) The first time this happened my eyes moistened and I wanted to run out on the floor and hug him, and tell him it was okay, he was doing great. At the same time I was proud of him for taking it, and moving on, for continuing with the class and trying hard. Used to abundant praise, Scotland took the high standards and intermittent rebukes hard. Slowly his enthusiasm waned and his desire to attend flickered out. 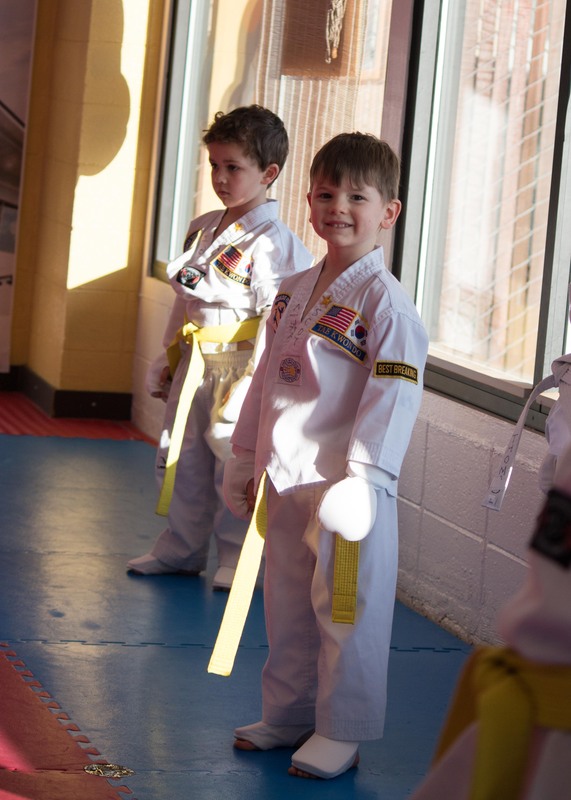 He threw a fit every time I told him it was time to get ready for Taekwondo, and towards the end, he looked miserable all through class. With a baby due any day, and our contract at an end, after a much deliberation between Tom and I we decided to stop taking. The decision was really hard on me. 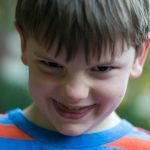 When should you make your child tough it out? When should you force them to learn the hard way, that sometimes things aren’t fun, but you do them anyway. Looking back I realize that Scotland was getting a lot of pressure from both me and his instructors. Perhaps if I’d let them be the hard-nosed ones, while I was the encouraging supportive one, he would have enjoyed it more. Wanting him to progress I would give him suggestions and voice observations on the drive home. I encouraged him to practice in between lessons, but he didn’t want to hear it from me. This leads me to the other dilemma that has been plaguing my mind of late: whether to send Scotland to a public kindergarten, or homeschool him. 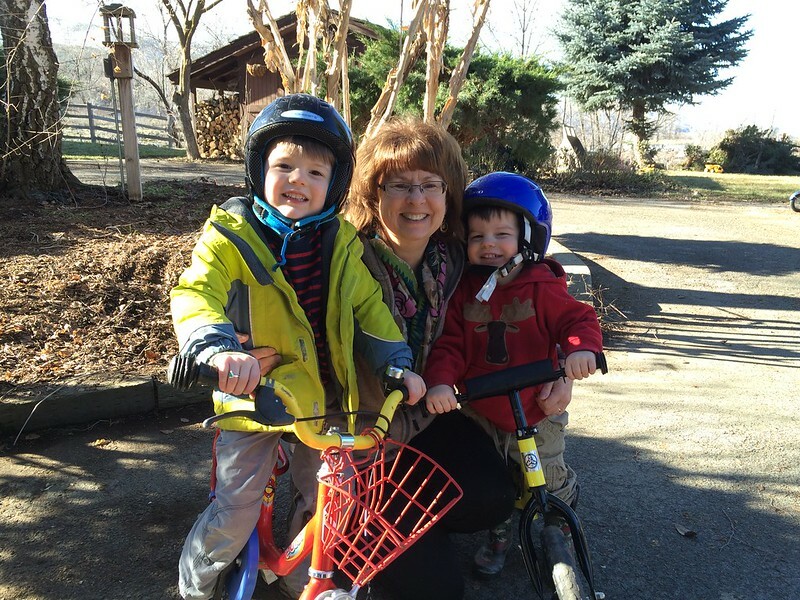 The question arose when I learned that half-day kindergarten isn’t available in our district. 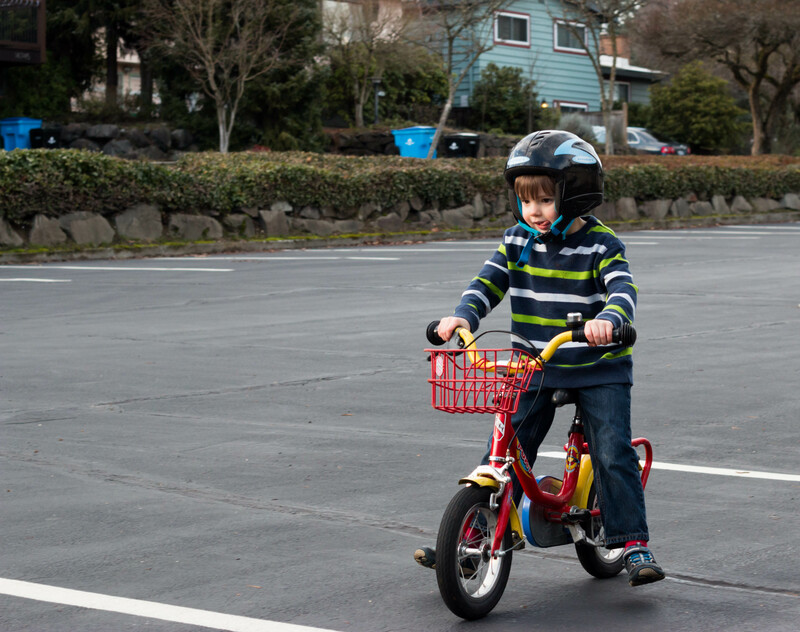 I hate the idea of sending my five-year-old to school for essentially seven hours a day, with transportation. Not only do I dislike the thought of Scotland being gone that long, but I also hate that that would mean that Anders would be without his best friend for the same amount of time. Then if he does extra curricular activities, that is more time apart. The thought makes my heart sick. Yes, my boys have their fights, and there are days when the thought of separating them permanently seems brilliant. (They are such gems on their own.) But for every one period of strife there are three moments of beautiful kinship and joyful play. Hearing them belly laughing and squealing with delight together is enough to “fill my glass” for a day. I can’t help but worry how their relationship will change if Scotland is gone most of the time. And then to think of all that Scotland will miss in Chiara’s development. From time to time I let my imagination run wild with the potential of homeschool, and it’s grand. I love the idea of each boy taking their backpack full of magnifying glasses, binoculars, sketch pads and field guides for a day of learning and exploration on the beach, or in the forest. I can imagine days spend creating maps, planning out treasure hunts and setting them up for each other. I want the joy and memories that would accompany this sort of learning environment. 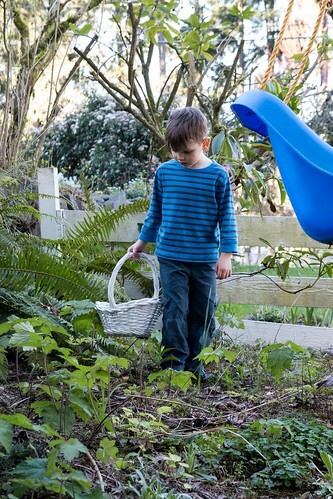 I love the idea of child-led projects, of Scotland meeting with people in the community to explore his interests. The potential is great. But I worry, would I really do those things? 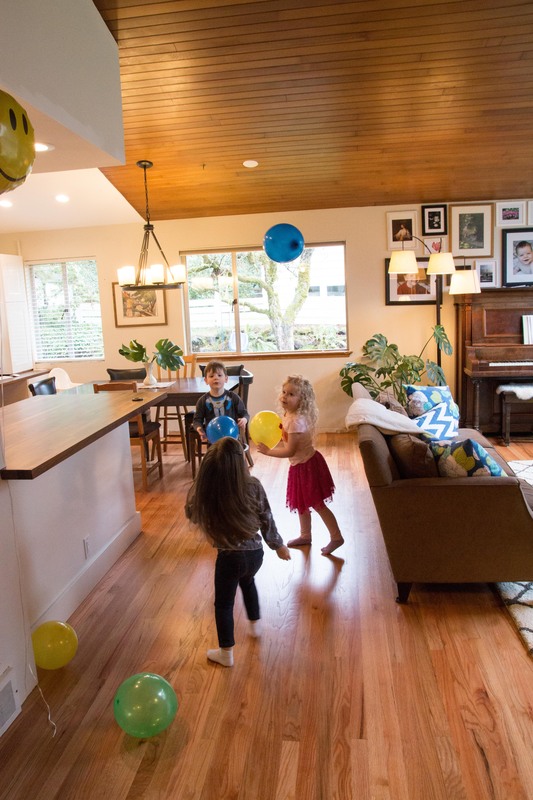 or would the daily minutiae of caring for three children and a home, win out, and would home-school become mundane workbooks, and a harried mother-son relationship. 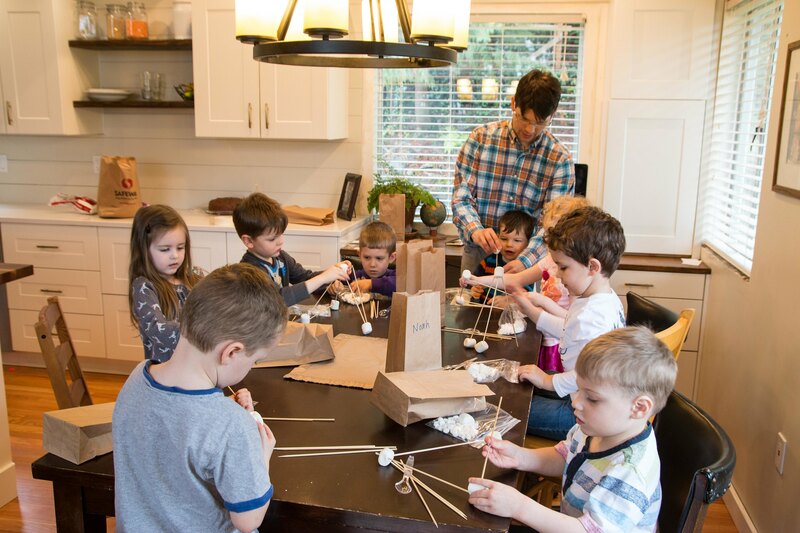 Would I seek out the sort of diverse and dynamic community I want my children to be raised in, or would our homeschooling be insular and isolating.Would the demands and time needed to homeschool being a boon to Anders and Chiara? Providing them with expanded exposure and experiences, or would it leave them on the sidelines? Realistically it would probably be some of all of these. Then there’s the weighing of benefits. Do I do the most good with my time by creating learning and bonding experiences for my children, or helping in my community, expanding my vocal studio, or serving at church? I could go on with these questions all day. One day I’ll be super excited about homeschooling, then the next day I’ll start to feel really anxious about it. So the next day I’ll decide I’m going to send him to public school and just pull him whenever I want. I’ll feel really at peace with that for a few days, but then I’ll start entertaining ideas about homeschooling and I’ll decide to do that again. . . and the cycle continues. In keeping my options open I’m on the “list” for five different schools! I guess you could call me indecisive. It’s hard! Not only am I making decisions that affect my life, but the life of my children! Whew. 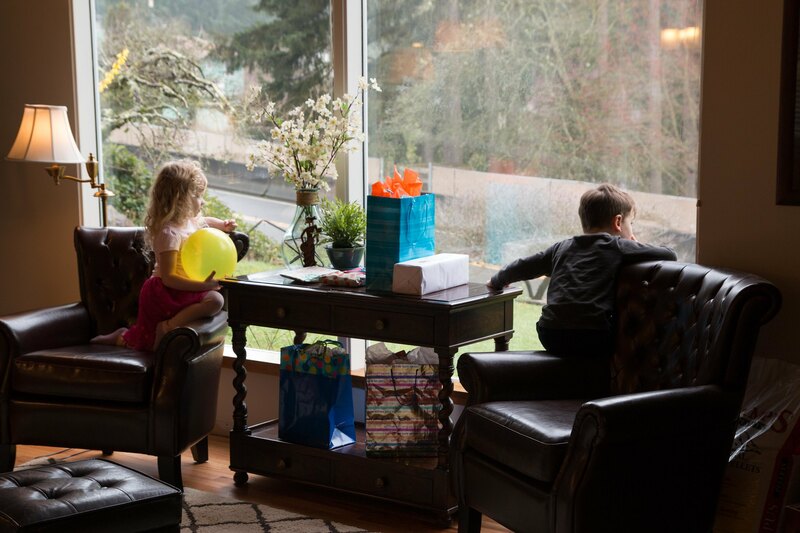 In the end it comes down to this: I want my children to be excellent, joyful, happy, hard-working, curious, creative, kind, faithful and close. I’m just not sure how to accomplish that! 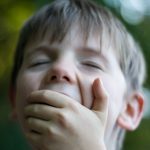 Author KjirstiPosted on June 20, 2016 Categories Family, Motherhood, ScotlandLeave a comment on Scotland’s Preschool Graduation- and questions about raising excellent kids. This weekend was our church’s spring General Conference. There are four general sessions, two each on Saturday and Sunday for two hours each session. It’s one of my favorite weekends of the year. I always come away from conference feeling spiritually edified and inspired. This weekend was no different. I’m grateful that baby is holding out, so we could enjoy this weekend together. I’ve worked hard over the years to make conference weekend something special for the boys. So I was thrilled when I heard Scotland exclaim to Anders as they snuggled on the rocking chair and chatted in the early morning hours, “Anders, it’s conference weekend!” Most of their excitement revolves around the special food that accompanies conference: cinnamon rolls, candy when they find the picture of the leader speaking, etc. But, I’d be selling them short if I didn’t give them credit for the joy they feel while listening to the talks and hearing the music. They both spent a significant amount of time just sitting watching and listening, commenting on the beautiful music, or the content of the talks. Considering their ages, they did a terrific job. 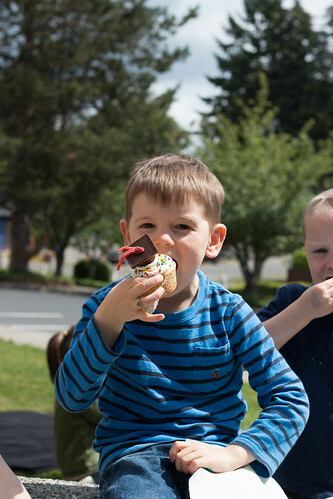 We took advantage of the gorgeous weather on today to enjoy a lot of family time- having a picnic between sessions, climbing our trees out back, and riding bikes at the playground in the afternoon. 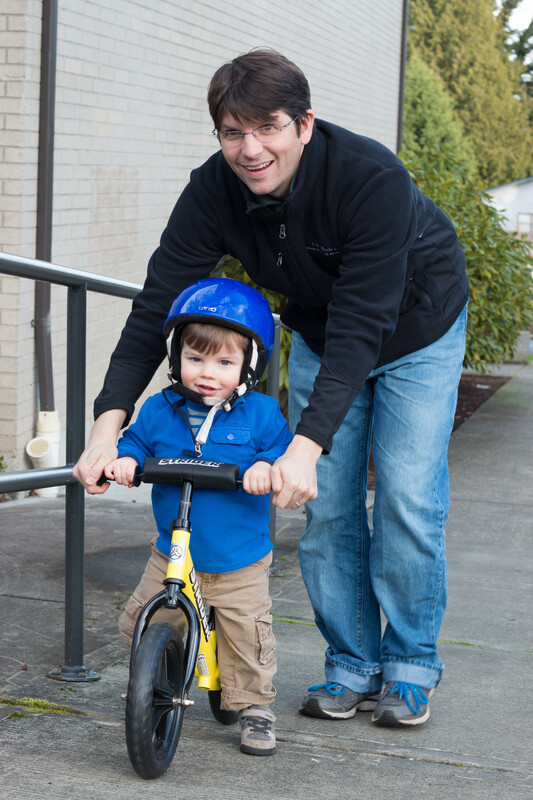 Scotland made it to a major milestone today: He’s now riding a pedal bike! 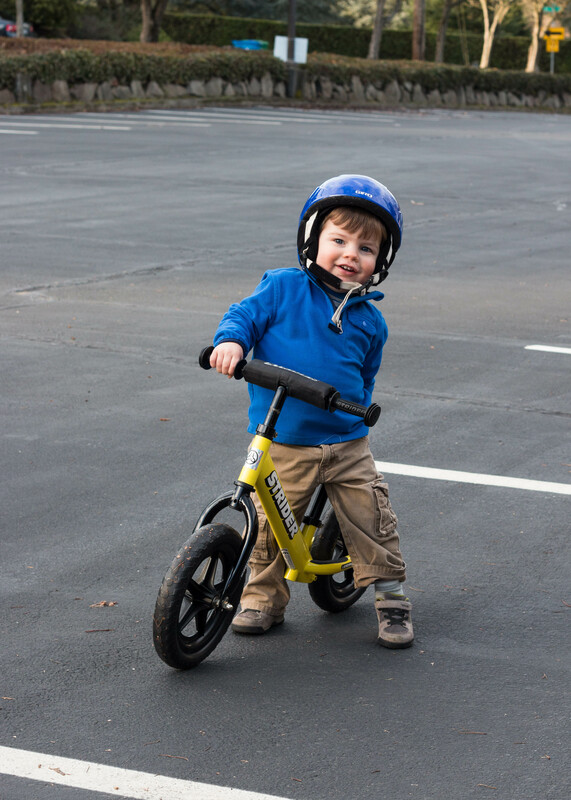 We took the training wheels and pedals off his bike several months ago to turn it into a balance bike. Today Tom put the pedals back on and he immediately took to it. It’s really quite a spectacular transition- especially if you’re used to the more typical scene of the parent running behind the bike and grimacing as the child crashes, over and over. We’re so proud of him. Both feet off the ground! 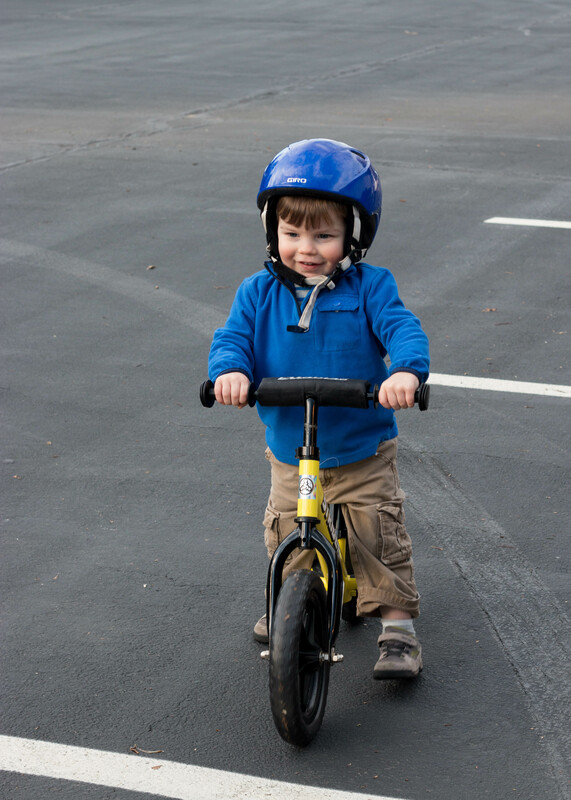 We’ve had a lot of bike time the last two weeks, and Anders has made significant progress on his strider as well. (Can I just say, that was the most perfectly chosen birthday gift!) While we were picnicking at the park with friends on Friday he started lifting up his feet while he cruised down the ramp at the park! And he’s now sitting on the seat and taking long gliding steps with his feet. It’s HILARIOUS to watch. And Tom and I both felt bad for repeatedly snickering. He’s very proud of his bike, and is very serious and persistent with it. Boy do we love having a playground walking distance from our house! Seeing both of these boys speeding around on their bikes makes me SO happy. I’m already planning summer bike rides, and thrilling at the thought of jogging along side them with baby in the stroller. I think I’ll spring for a baby seat on my bike when she’s old enough so we can all ride together. We’ve seen so much more of Tom the last few weeks, which has been SO wonderful. This weekend just really felt like normal family life- we had a s’more roast with friends, Tom and I watched a movie together, we had meals together, we laughed, and enjoyed our boys. And it just felt so right. We both feel really grateful that we’ve had this time leading up to our baby’s birth, so we can welcome her in with warmth, love and genuine joyful anticipation. Author KjirstiPosted on April 4, 2016 Categories Anders, Family, Outdoors, Religion, ScotlandLeave a comment on Happy Conference Weekend! We had a beautiful Easter- spread over a few days. 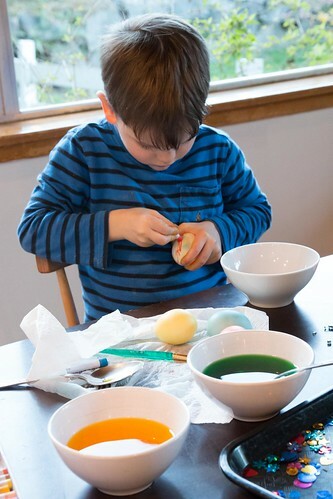 We dyed eggs Friday night for “Family Fun” we hid two sets of plastic eggs inside on Sunday and then hid our boiled eggs outside on Monday (Since Sunday was rainy and cold, and Monday was beautiful.) We had our spiritual lesson on Monday for Family Home Evening, as Sunday was taken up with church and dinner with the Vogel’s. I managed to get one quite snap shot on Easter when the rain broke for 15 minutes before church. It’s a pretty accurate portrayal of our family: Anders looking sweet, Scotland being silly, me smiling though clearly stressed out, and Tom trying to keep the peace. I’m not sure why Easter Sundays are always so stressful for me. 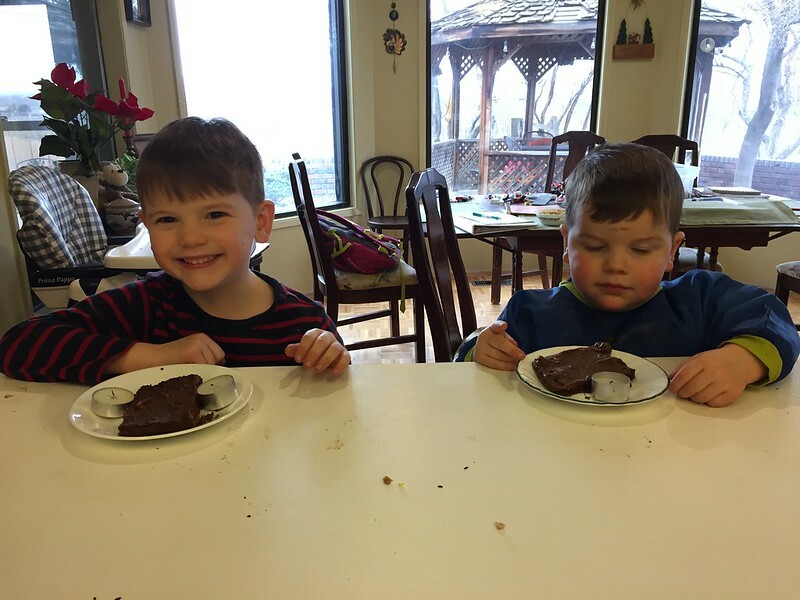 I’m afraid the attempt to get two wiggly high energy boys to church without dirtying their clean pressed shirts, or rumbling their brushed hair is an overachievement. 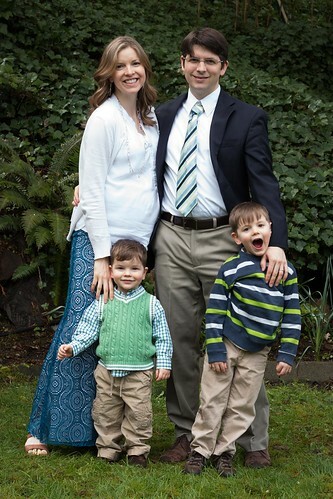 But I keep trying, unsuccessfully- adding a family picture to the equation was the sinker this year. Thanks to the classical radio station for calming my nerves before Sacrament meeting. 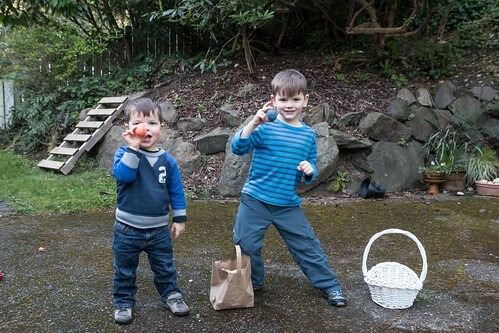 The boys had so much fun with all the egg hunts. They loved hiding the eggs for each other, and for us. 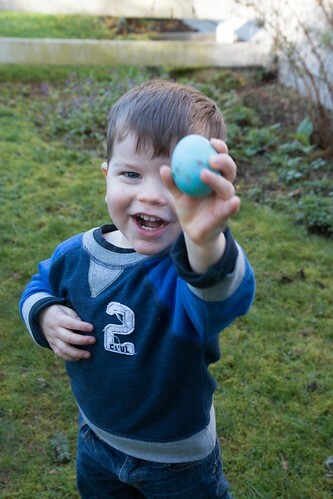 Anders ran around the yard enthusiastically, exclaiming whenever he found an egg. And Scotland was determined to find the “hard” ones we had hid for him. I prepared the “Easter Bag” activity from the Friend, for FHE. It involved a collection of items that symbolized different events in the last week of the Savior’s life. We then read the scriptures and the boys found the item mentioned. I’m still surprised at how well my boys understand the scriptures. Anders excitedly picked up the little plastic cup when I read “Let this cup pass from me.” As is the norm their was a good measure of silliness, but I hope that the boys felt some of the spirit that I felt. Especially as I read the passage of Christ appearing to Mary before he ascended to the Father. The emotion captured there is stirring. I felt a measure of the joy Mary must have felt at seeing her Lord alive, and was glad to be able to bear testimony to the boys of the living Christ. I’m so grateful for sacred holidays for bringing these discussions to the forefront. I’m grateful for a church that nurtures spirituality in my boys. There are few things that I love more than hearing them sing primary songs as they play- often filling in lyrics or making up melodies where their memories fail them. I’m grateful for how their testimonies strengthen mine. Mostly, I’m grateful for my Lord and Savior Jesus Christ for filling my heart with joy, my mind with truth, and my soul with peace. I kept a consistent pictorial record of my first pregnancy. (here, here, here) My second pregnancy though less thoroughly documented also featured several posts, though less directly related to my pregnancy. This time around I’ve posted far less on every subject, so following suit, my pregnancy has hardly been noted, except for this one post. I can’t sleep so I figure 4:00AM is a wonderful time to document a few things. I’m in no means an old Mom, so perhaps it’s just the result of it being my third pregnancy but I’ve had a lot more pain this time around. As a result I’ve had to significantly decrease my level of activity the last few months. Which has been really difficult for me. 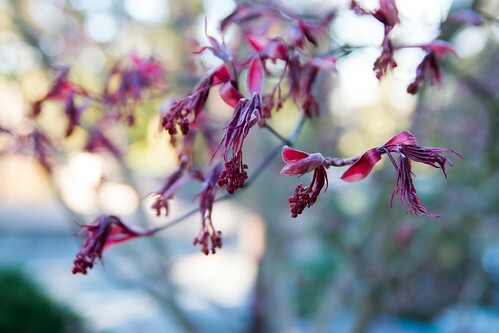 Especially with spring bursting out, I have such an itch to head out on a long run, or at least a spritely walk. From time to time I’ll throw caution to the wind and head out regardless, only to suffer the consequences the rest of the day or week. I’m pretty sure I have PSD, which essentially means that the hormone relaxin has over loosened my pelvis making it abundantly obvious that my pelvic cradle is made up of not one but two bones. Asymmetrical movements like stepping into a car, or climbing onto bed are painful, and even when walking I can feel the two sections of my pelvis separating and connecting. Sitting for long aggravates it, and by the end of the day I’m all too happy to settle into my “throne,” as Tom calls my leather reclining rocking chair. It’s definitely been harder to be pregnant and have a two year old, as opposed to a three year old. Anders still insists that he is a “baby” and he loves to be held. I love to hold him, but any more I have to curl him up above my belly which is pretty ridiculous considering his size and weight. Cuddling when rotund as I, is awkward and Anders often gets frustrated by his lack of options. There is still a lot of picking up and carrying necessary with a two year old, which at this stage of pregnancy is trying. Last pregnancy i had terrible cholestasis at this point. Knock on wood, but it hasn’t been as bad this time around. It’s often what keeps me up on nights like tonight when Tom comes to bed super late, and wakes me- my itchy feet and hands often make it hard to fall back asleep, but it hasn’t kept me from falling asleep as much as it did last pregnancy. I’ve been measuring small this pregnancy, which was NOT the case last time. I’ve had a couple of extra ultrasounds as a result, and everything looks fine, it just looks like our little lady probably won’t be over 10 pounds like her brother. Thank goodness! Anders is less aware but he still talks about baby, especially when Scotland is doing so. He’s spent more time carry for our lone baby doll, and even took her wrapped up in a blanket with a bow and pacifier to Taekwondo the other day. As I mentioned, if you ask him if he’s a big boy or a baby, he’ll exclaim that he’s a baby. I’m curious how he’s going to take the new addition. I have had such an outpouring of love and support with this pregnancy. I’ve been astounded by the number of people who have brought by gifts, and offered to help in any way. Just yesterday our neighbor Barb brought over a gift for each of the boys and an outfit set for the baby. Another friend offered to grab me groceries if I ever need it. Every Sunday some new sister smiles as she hands me a gift bag. One of the things I love most about pregnancy is how it unifies us as women. I never feel more female than when I’m pregnant, and nursing. 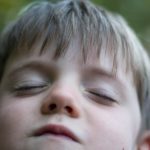 In preparation for the psychological aspect of child birth I recently read this article. It really resonated with me. For any of you who have followed this blog, this won’t come as a surprise to you. Anders birth story was a certain account of the power of women. It’s something I’m rather passionate about. Don’t get me wrong, I do my fair share of complaining about pregnancy- especially at this stage, but I also really cherish those pre-sleep snuggles with my little one, when I’ll chase her limbs around my belly, and seek out her little back to rub. I’ve loved decorating her nursery, because it’s carved out time for me to think about her, dream about her, pray for her. 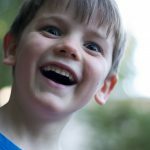 A few weeks back I started to get waves of anxiety whenever I thought about my approaching status as Mother of Three. How was I ever going to have enough love, patience, understanding, and creativity to lovingly and joyfully care for three children? It kept me up at night. But all it took was a slightly longer prayer session to be reminded of the source of all Goodness, and that “I can do all things through Christ who strengthens me.” Only He can gift me with charity, endurance, energy, and perspective beyond my own. I believe He wants me to enjoy this upcoming period of my life, despite the challenge of it. I’ve put my faith in Him that He will empower me to do so, despite the fatigue, pain, and hardship. Scotland has his first friend party this year. He invited eight of his friends. After much discussion we settled on a building theme. We built a huge fort downstairs, and then set out the marble track, duplos, and legos for the kids to build with. We made marshmallow catapults and saw who could shoot them into their bowl, enjoyed a decadent chocolate cake and ice cream and opened presents. It was simple, but successful, I think. All the kids seemed to have a good time. Dark Chocolate cake- Scotland’s request. 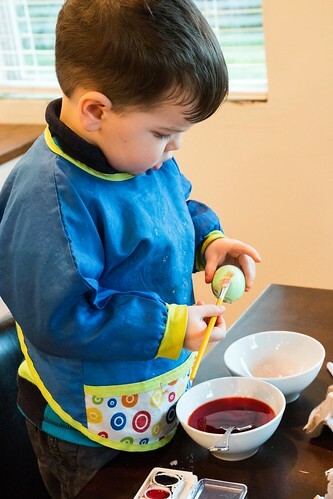 We still need to make the raspberry sauce he wanted to go with it! Friends: Ava Kirkwood, Noah Hulet, Daniel Bonham, Theo Jensen, Jane Clark, Cole Watkins, and Emma Gordon. Scotland turned five on Monday. 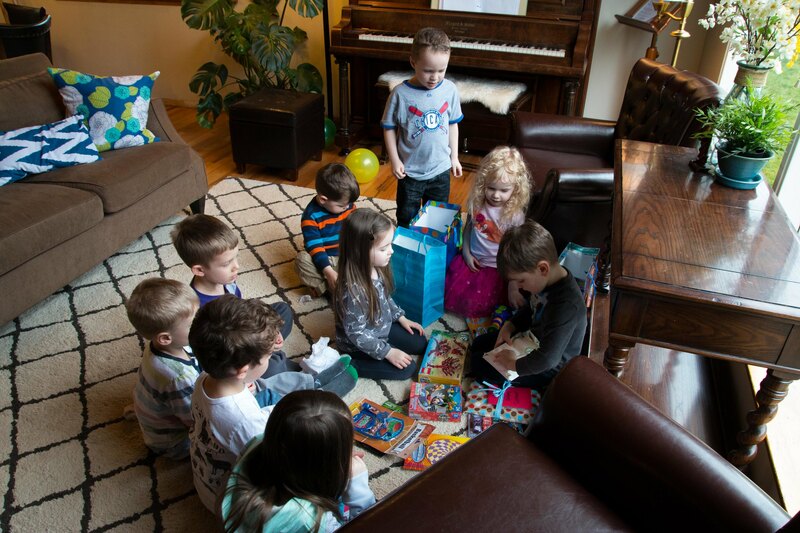 It was a much anticipated birthday and he’s thrilled to finally have joined the bulk of his friends at this magical age. We had a simple family celebration on Monday with his dinner request of balsamic glazed salmon and mashed potatoes, grape juice, fruit salad, and chocolate chip cookies. We opened presents: the new illustrated Harry Potter book, a taekwondo comic book, k’nex, and sparring gear. (He received his sparring gear last week, and hardly took it off for a few days!) We then headed out to watch “The Good Dinosaur” at the $4 theater in town. I decorated his door and filled his room with balloons the night before. And Tom bought him a helium balloon on his way home from work. (Which was one of Anders favorite gifts, though Scotland was excited, it hasn’t gotten near the hype of Anders balloon a month ago.) 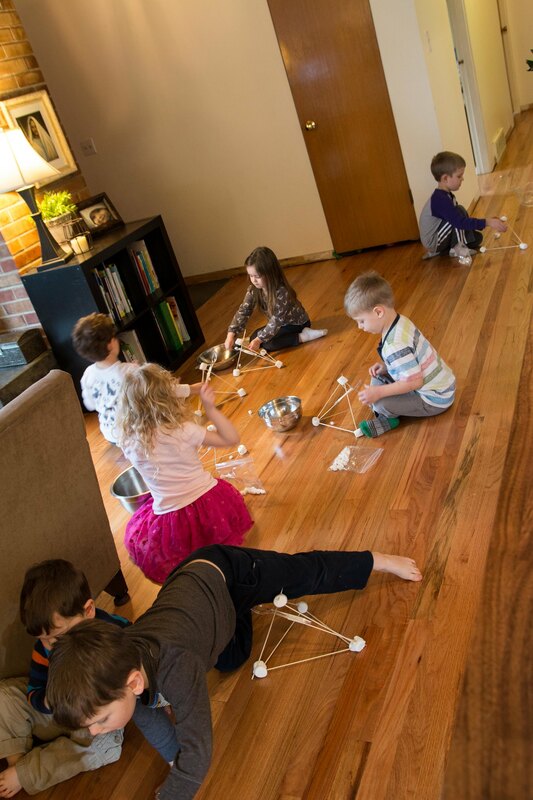 This Saturday we’re having eight of his friends over for a chill “building party.” We’ll see how that goes! He’s excited, so hopefully it lives up to his hopes! I love sitting down and writing these milestone posts because its very therapeutic for me. It helps me reflect on sweet memories, positive characteristics, and funny moments. Too often in the spiral of life, I find myself overwhelmed by Scotland’s weaknesses and shortcomings. I get so fixated on his “issues” that its all I see, and I start to loose sight of the sweet, thoughtful, kind boy he is. I start treating him differently as a result, and of course, that only exacerbates the problem. The past two weeks have been rough in that way. So I’m grateful, tonight, to get to focus on all the things I love about Scotland. Scotland is a very social boy, and LOVES doing things with friends. He has grown very close to his buddy Noah. Noah’s mom Caroline is one of my best friends, they live down the street and the two boys do taekwondo together. (Noah is the curly-haired boy in the picture above.) 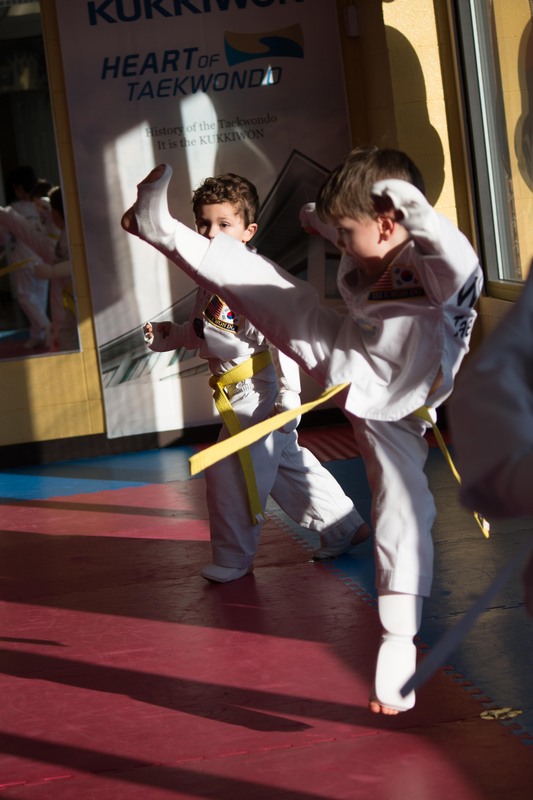 For a while the two of them were very competitive, and driving them to TKD made me crazy because they would one-up each other the whole time. But they’ve gotten through that, and now they are sweet, supportive, buddies. It makes me happy to see what a kind friend Scotland can be. We took the pedals and training wheels off of Scotland’s bike, and he has got the balancing down. Now we just need to wait for some more good weather, to put the pedals back on and watch him take off. He’s pretty gutsy on his bike- which totally freaks me out! Scotland always looks forward to his mornings at preschool. 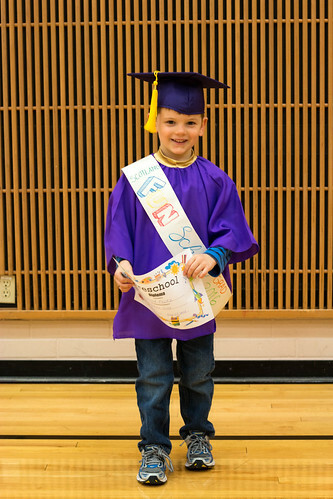 He’s part of a Mom-taught coop preschool with five other kids. Four of us moms rotate teaching and the other two are in charge of weekly outings. We have teaching days Mondays and Wednesdays with outings on Friday. Scotland prefers to know everything, and isn’t teachable by nature. He absorbs silently and then happily imparts his knowledge later on. “Did you know XYZ!” (He’s always very bummed if I do. Often asking “How do you know that?! Since I didn’t attend preschool with him!) He loves free-play time the best- always thrilling at the opportunity to play super heroes with his buds. Scotland is on chapter 65 in his “Reading Book” and as a result, is reading full sentences, and 5-6 sentence stories. When he applies himself he can fly through an entire story with little difficulty, but it’s hard work, and more often than not, he’s not thrilled to sit down and focus. It’s one of the more challenging parts of my mothering day. Despite his resistance, he takes great pride in his skills, and was all too keen to show off to his friend when she was over- reading her a book. He’s started to spell a bit, but rarely tries to read things outside of our reading book time. We’ve been terribly inconsistent, but we’re trying to have a 15 minute piano lesson twice a week. Usually we only have it once. Scotland resists being taught, but he is slowly picking things up. He played the first half of “twinkle twinkle” by himself last week, which caused us both great excitement. While we haven’t been great about regular lessons, he has started to just sit up and play more, which I love. Scotland’s designs for a catapult. He then went on to build a functioning catapult out of tongue-depressors, mini cups, and tape. Scotland continues to be obsessed with Legos. He can spend hours creating things. I’ve been intrigued by his creative process. He’ll have periods where he builds the most extraordinary machines, and then he’ll seem to draw a blank and revert to much more simplistic designs. I wish there was a LEGO club I could get him involved with. (They’re all for older kids.) because he gets so much inspiration from building with others. 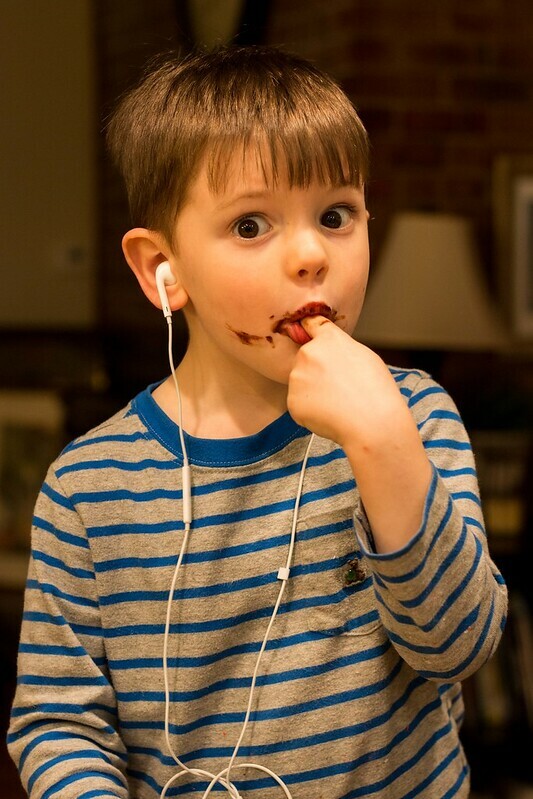 A more current interest is audiobooks. We bought him a CD player for his room for Christmas, and introduced him to them. He went wild for them. For a while, I was worried I’d have to limit his usage, because he would just hole up in his room and listen and build legos forever, refusing to come out for story time, piano, even meals. So far he’s loved the Magic Tree House books and Ms. Piggle Wiggle books. And is enjoying “A Little Princess,” right now. It’s funny because he likes to listen while he build LEGOS, and because it’s pretty loud when he digs through his LEGO bin- he blasts his books. So for weeks Ms. Piggle Wiggle was resounding throughout the whole house! 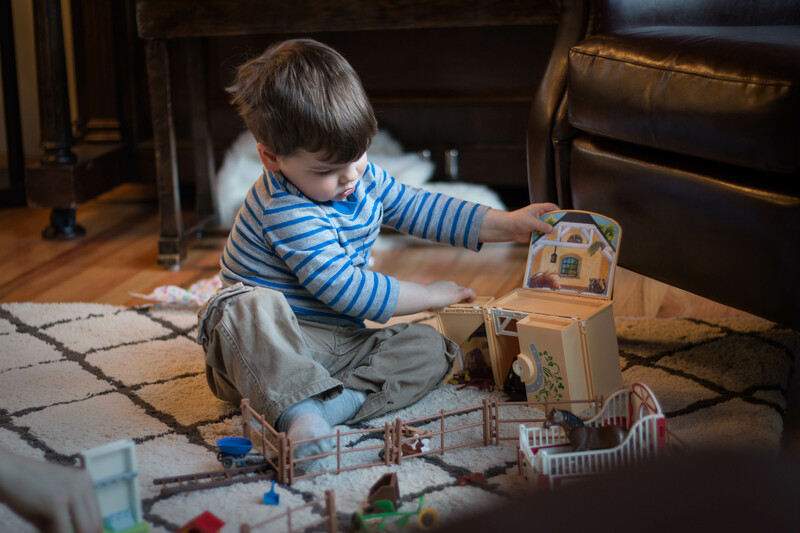 One Saturday the boys and I were building LEGOS together, we’d chit chatted a bit but were mostly quiet, intently building when Scotland asked, “Would you like to listen to my audiobook?” I told him, I was okay not to, since I’d already heard Ms. Piggle Wiggle several times. He paused for a second and replied matter-of-factly. “Well, I’m going to, because I like it.” He happily conceded to listen to “Magic Tree House” instead, and suggested we listened to a chapter he had been too scared to listen to while he was alone in his room. He wouldn’t be scared now, he assured me, since I was there with him. I was impressed at how he navigated through the tracks, finding just the chapter he wanted- he clearly had the book pretty well memorized. He continues to adore picking wildflowers. He’s been SOOO thrilled that the dandelions are popping back up, and brought back a beautiful little nosegay with a variety of flowers and foliages on our last walk. He was super eager to plant peas in our garden and the begonia tuber I bought him. Practicing how to care for a baby in FHE- Scotland was all ears! Scotland can be both the sweetest brother, and a total punk. I wish I knew the trick to switching him into his sweet brother mode, because there is nothing more endearing than hearing him and Anders giggling and chatting as they play together; and nothing more aggravating than hearing Anders screaming and crying over and over again as Scotland takes stuff from him, pushes him, calls him names, etc. After having two children I can’t imagine ever only having one. The sibling relationship is so special, and seeing the way both boys learn and influence each other is one of my favorite things. Anders is a very warm, social, affectionate child with a ready smile and a quick hello. Scotland has picked up on how much attention he gets from this and had started to adapt more of those characteristic himself. I was delighted to see when we visited my parents’ last that Scotland was much more interested and involved in the farm work. 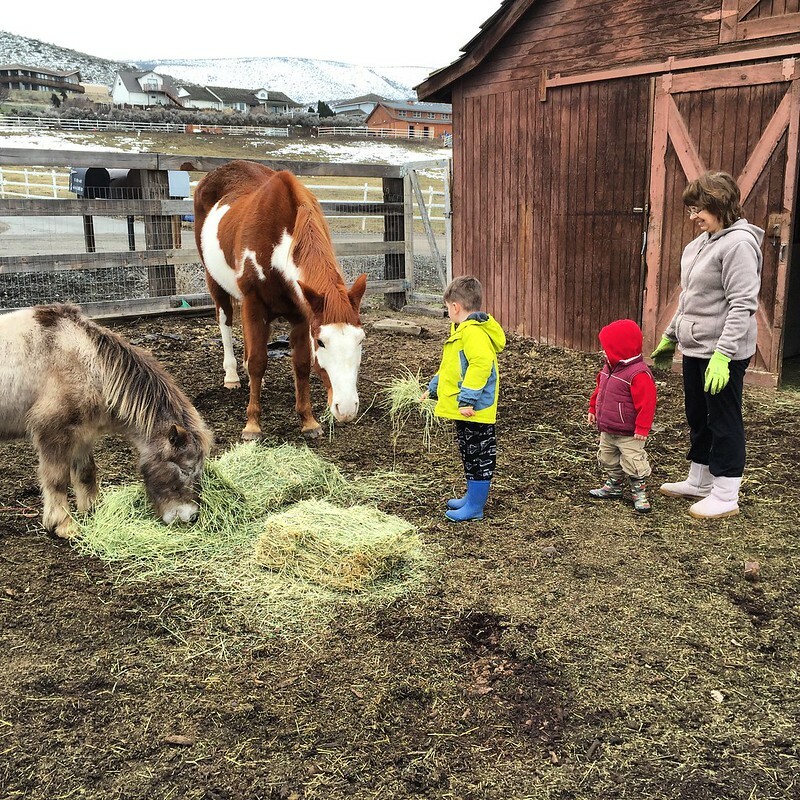 In the past he hasn’t had much interest in feeding the horses, gathering the eggs, walking the dog, etc. But this time he was much more eager and would go out everyday, despite the chill. Scotland adores his father. It’s been hard on him that Tom has been working so much the last few months. And I don’t think I give him enough credit for how much it effects him. 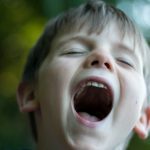 Scotland loves to sing, usually his own songs, though he’s started to sing snippets of Primary songs and his piano songs. It’s a regular occurrence to hear him belting out some dramatic tune while playing toys. He is quick to correct inaccuracies, copying me in commonly saying “Actually . . .” (This doesn’t always go over so well. (This is just one example of how Scotland’s behavior has shed light on my own poor habits or injustices.) He is very health conscience and will often coach his friends on how they should eat. Informing them of the health of the apple peel, or how they should eat the crust. While he isn’t as phenomenal an eater as he once was. I would say in general he’s still a very good eater compared to most kids his age. For a while it was always a fight to get him to wear socks. Finally one day we were out running errands and despite him telling me he was wearing socks, when we were half way through our JoAnn’s list he started crying that his foot hurt. Removal of his rain boots revealed a blister. I asked him why he thought he had gotten a blister. He thought for a moment and then admitted that it was because he wasn’t wearing socks. This was actually rather proud parenting moment for me. I didn’t do my typical and “piggy-back” on the consequence by laying on one of my own- even though his screaming about the blister made this difficult. But rather helped him work through ways to avoid blisters in the future- wearing socks, and then kindly helped him with a bandaid- and a pair of socks that were fortunately in the car. Now he always wears socks. It was a definite testimonial to the power of utilizing natural consequences. It’s always fun to look back and reflect on the beginning of a life. Reading back over past blog posts (here and here) I was reminded of that significant day two years ago when this sweet chubby boy entered our life. He has blessed our home with such joy, camaraderie, and laughter. His quick smile, and spunky personality has changed all of us. We all smile more. As his vocabulary has increased his personality has become even more pronounced. He loves to chat, be involved, and spark conversation. He’s always in for a good joke, and if no one else has one, he’ll come up with something. 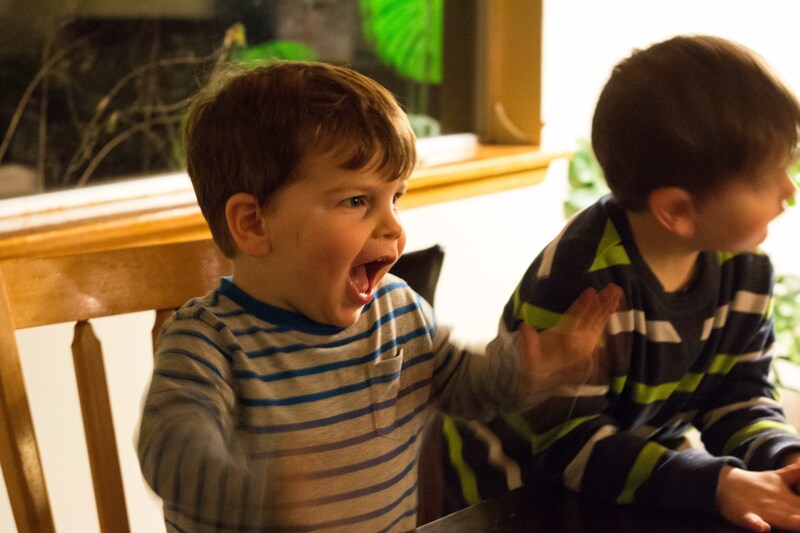 His exuberance and celebratory style are contagious. (Bare bottomed, he often comes galloping out of the bathroom after his recent potting tries yelling “Come, Come! !” with a broad smile and bright eyes.) His emotions are intense, be they joy or frustration, and he can lash out with surprising tenacity and furor. He slapped Tom hard across the face just this afternoon, after Tom dared put him in his car seat! Needless to say, emotional coaching is ongoing. We celebrated Anders’ birthday today. 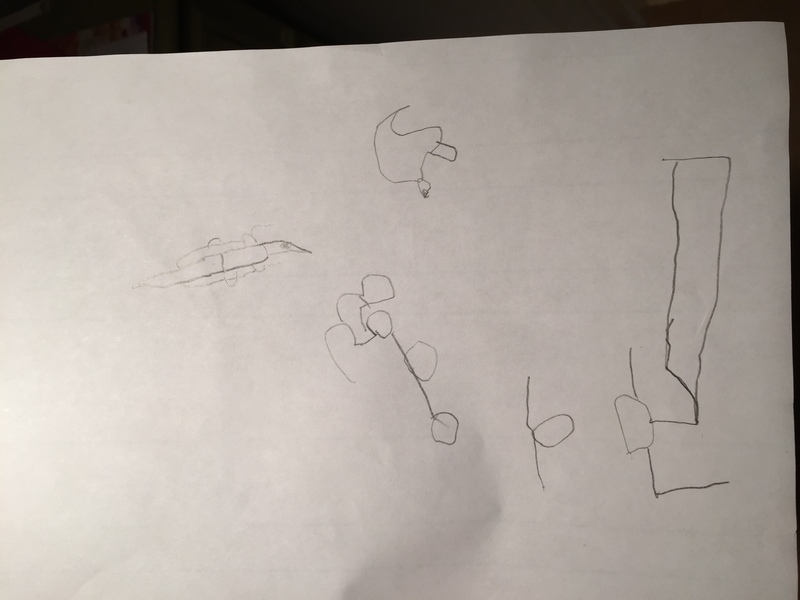 Scotland was SO excited about preparing for it last night that he was up until 10:00 or later, helping me decorate a poster for Anders’ door, sneakily stuffing balloons in Anders’ room, and creating his own little surprises- toys in a sock and our “Happy Birthday Hamster!” book at his door. He just kept coming out with a new idea of how we could make Anders’ birthday special. It was really sweet. I scored a whole bin of Playmobile toys on Craigslist. 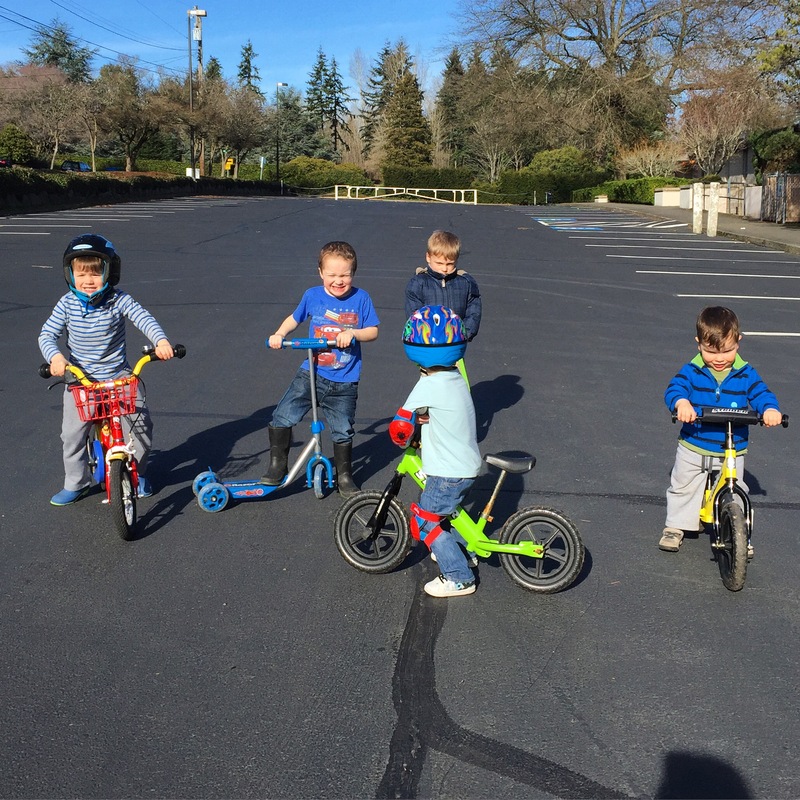 (Along with the Strider balance bike below.) The lock and key on the fold up stable was a favorite. 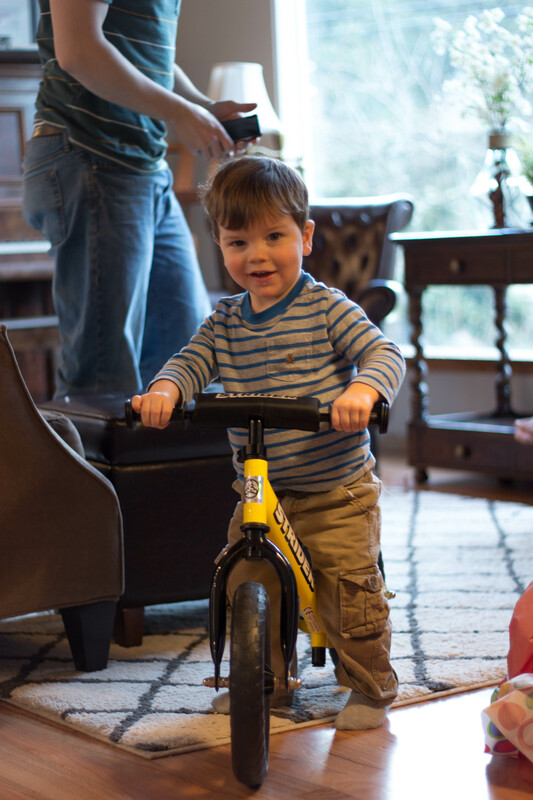 Anders is very aware of what it means to be a big boy, and this bike just seemed the perfect entrance gift. A true sign that he had arrived! Anders was so proud of the cake I made him. 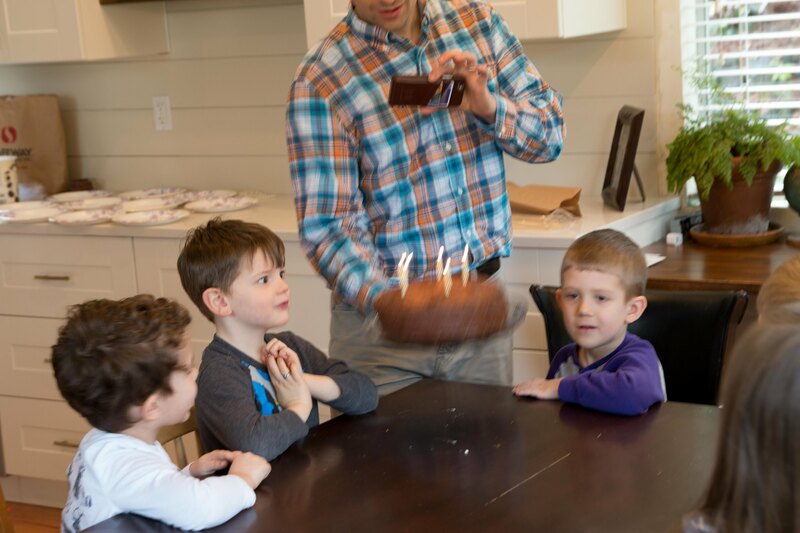 When our friends the Hulets arrived for dinner, he galloped over to the kitchen saying “My cake! My cake! 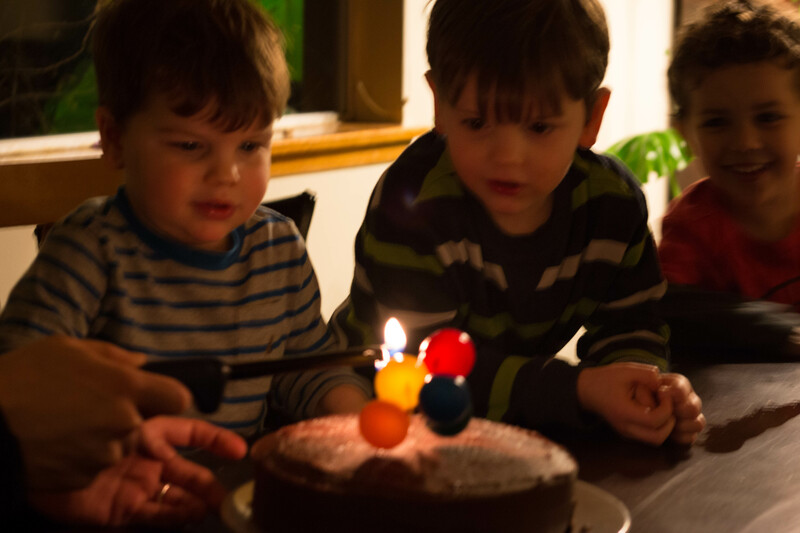 Look!” He blew out the candles as soon as Tom lit them, with surprising accuracy. It was a simple birthday, but a sweet one. I took every opportunity I could to hug him, kiss him, and tell him how much we all love him! Comfort items: Lovey, Chippers, and blankie- andy one of his Aden and Anais blankets. “Lovey” (a half bunny half blanket little thing) is his favorite, he’ll hold it and rub his fingers across its silky ears over and over. Mimics. If he sees me wave at someone he’ll quickly look up and wave. If he notices I always put in his water bottle in one corner of his bed, then he will start doing that too. He seems to be a creature of habit, and loves structure and patterns. Likes puzzles, and patterns. Sorts things by color of his own accord. He calls all classical music “Mouse” since watching the Nutcracker. “’kay”- pretty logical. You can talk him through most things. Identifies women as Mommy’s and the elderly as Poppas or Grandmas. Loves to dance. At the end of movies when the music comes on he’ll jump up then turn around and hold both hands out, welcoming Tom or I to join him. Potty training- “Come come!!! !” Treat?! People comment on how “content” he is. As of yet never any separation anxiety. Scotland usually walks him to nursery. Loves to sing the hymns and have his own hymnbook at church. Very aware and sensitive about what is his. (Christmas really helped this- as he seems assured that we would give him things that would just be his. Often if you say “Yes that’s yours, but would you like to share?” He’ll happy offer the toy to a friend. “You okay?” Often checks up on Scotland or I if we indicate that we were hurt. Loves walks and sitting in the stroller. “Myself!” He loves to be independent. Clipping his top seatbelt, setting the table, putting away the silverware, cleaning up after spills, carrying in the groceries, cooking, cleaning up toys, closing doors. Very aware of how he can help- grabs the dustpan for me, when he sees I’ve created a pile, puts the laundry soap in the dishwasher when I’m filling it, “Help you?” He’ll ask, if he sees me carrying a basket of laundry, or a bag of pellets, and start “helping me” carry the item. Silly. He loves to laugh and make his brother laugh. He’s picked up on what some of Scotland’s friends think is funny. 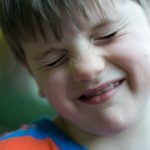 Using words like “stinky” or “diaper” in hopes of getting a laugh. Opinionated. He doesn’t like being mistreated, and will let you know LOUDLY if he doesn’t agree with the course of things. Can throw a royal tantrum- spitting, yelling “No” or “Not nice!” and occasionally hitting or throwing things. Fake cries, coming up to me to report injuries. “Sta-was” (Star Wars) when he saw me return a star wars book Tom had been reading to Scotland, and sometimes Anders at night. Loves to run, and jump. Always jumps off curbs. Galloping. Social. 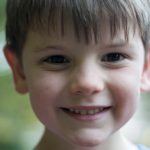 He loves being a part of preschool, going to playdates, and being one of the “big boys” when Scotland’s friends come over. He’s learning all their names and will say “Hi Noah” with his low raspy voice when he sees him. Pats on the back. He will still give you pats on the back when he hugs you, which for whatever reason, totally melts me- it seems so mature. “Toes!” I love uncoding his limited vocabulary. He’ll say “toes” to indicate that his pants need to rolled up, that he has something stuck on his foot, or that the floor is cold. He’s using three word sentences all the time now. I really adore this age and their excitement to communicate. He LOVES to talk, and will fill in sentences with non-words if need be. He labels everything he sees and we’re often surprised at what words he knows. He said “Sta wahs” the other day when he saw me returning a Star Wars book at the library. 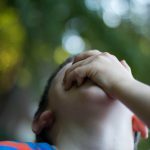 When he thinks something is really funny he’ll cover his mouth with his hand and rock his head as he laughs. He loves finding the duck hidden on every page of our Usborne “Farmyard Tales” books. He loves doing “Reading book” and taking piano lessons, always reminding me to “Bow” when the lesson is over. 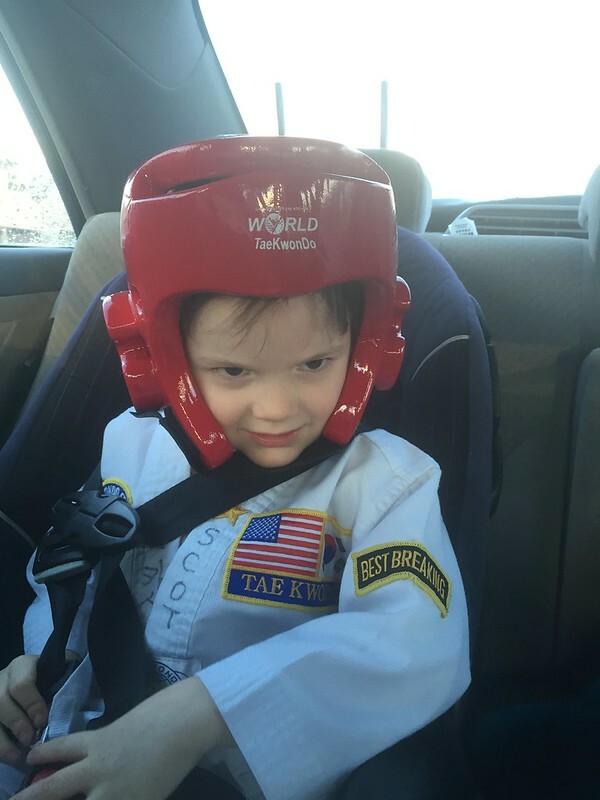 He continues to watch attentively during Scotland’s Taekwondo classes, and practices the moves at home- often under the tutelage of Scotland. Similarly, he has learned a good portion of the sun salutation, thanks to our yoga sessions together. He really enjoys our “learning time” together when Scotland is at preschool. We do puzzles, play games, and work on other enriching activities together. Loves books. He sits and listens attentively to all four-five books we read before quiet time and bed time each day, often commenting on the pictures. “I don’ wannit” – when he doesn’t like something. 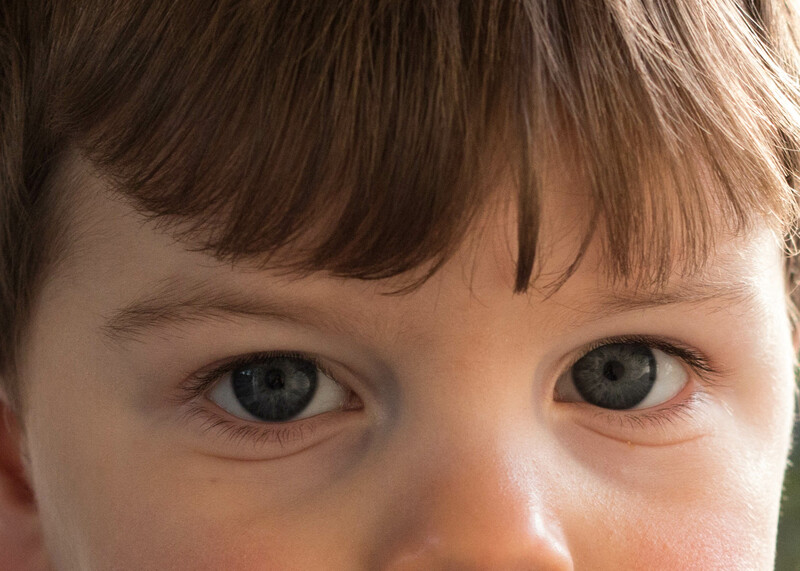 Author KjirstiPosted on January 30, 2016 Categories Anders, Family, Scotland1 Comment on Happy 2nd Birthday Anders! -Scotland is still leaving “stockings” for Tom by his bedside. Yesterday, his sock hung from his bedstand drawer and inside was our Happy Family Dad toy. 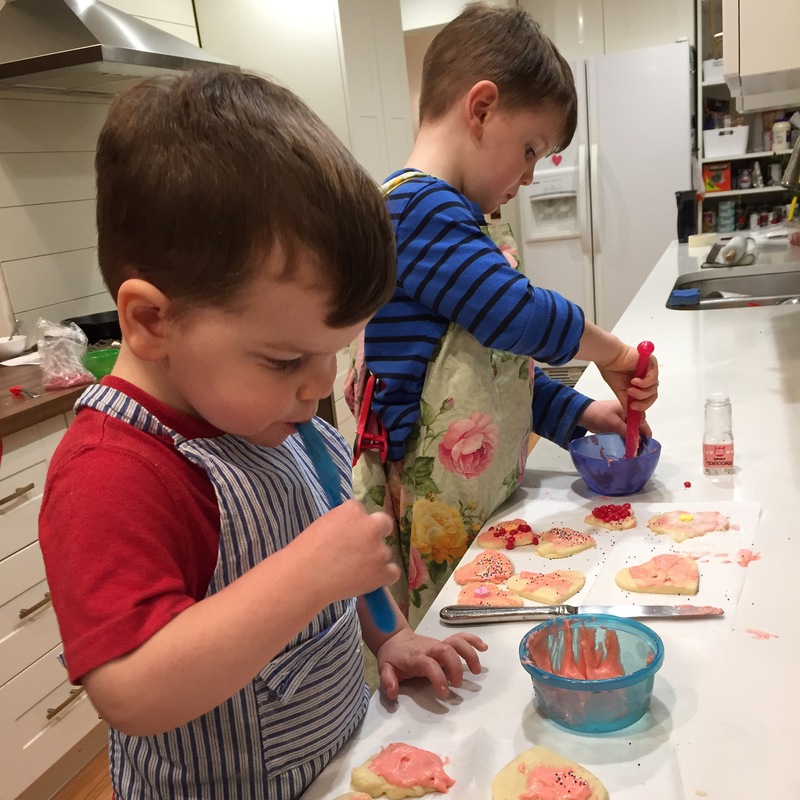 -I left two cookies from our last night “family night” treat for the boys, and told them they could eat them before breakfast while I did Yoga. Together they decided that they would each save a piece of their cookie for Dad. -Often when going downstairs, Anders will stop at the top and say “Bye Mom,” and blow me a kiss. -I’m very strict with treats. So when I loosen up and unexpectedly offer a cookie after lunch Scotland almost always gives me a kiss and hug. – Anders has the best manners these days. He tilts his head when he says please, and says “Tank ew Momma” anytime I give him anything. -The other night during movie night both boys joined me on the rocking chair. Reclined back enjoying “The Tale of Desperaux” I felt immensely happy. Two boys beside me, and a little gal kicking happily inside. -Anders often struggles to wake up. From time to time I’ll go in and sit on the end of his bed, he’ll lay his head on my lap and slowly come to, as I rub his back. -Scotland has learned that sleep is to be respected- thanks to many post call Dad days. The other morning Anders had woken up at 5:45 and gone back to bed with me, Scotland was up around 6:30, peeked in on us, and seeing us asleep closed the door so as not to disturb us with the light in the adjacent room- and then played quietly. -When Anders will snuggle in close to me and say “Momma!” with a sigh, when he joins me after his ridiculously early wake ups. -Anders has gotten into the habit of waking up with Tom at 5:45. (He now typically wakes me up before Tom’s alarm does.) They have developed this little ritual of Anders sitting on Tom’s lap and eating dry cheerios for a few minutes before Tom brings him back down to bed to finish the night off with me. -Often when Scotland or I will stub our toes, or say “Ouch!” Anders will come up and ask with a tilted head and sweet voice “You okay?” He’s even taken to giving Scotland hugs when he accidentally hurts him. -Today I was watching a friends two sons. The younger is just one. Anders mothered him the entire time, showing him toys, taking him to the window to watch the cars- and pointing them out to him, and making sure he didn’t get into trouble. -Scotland’s willingness to incorporated Anders in his play, and teach him various skills always touches me. He’s consistent with his Tae Kwon Do lessons. He’s always very encouraging. Squeaking “Good!” in a high pitched voice, when Anders follows orders. This evening as I was preparing dinner he came running into the kitchen: “Anders is going the potty.” He had helped Anders with his pants and diaper, and coached him, until Anders was able to release four small poops. After each one, Scotland washed out the potty and encouraged him to do more. I gave them each 4 mini marshmallows for their efforts. Satisfied they went back into the bathroom for more. I actually had to say “Okay, no more going potty. It’s time for dinner!” Both teacher and student were ecstatic with their progress. -Anders is becoming quite the ham, and there is nothing he won’t do if it will make his brother belly laugh. They’ll get going and then anything becomes hilarious. -I had a rough night a few days ago and wasn’t very patient with the boys. Anders came out of being put in his room, a few tears running down his face, and his head down. I apologized for being impatient and bent down to give him a love. He gave me a sweet, full hug and patted me on the back, total forgiveness in his eyes. I try to savor all the times when either boy will just nuzzle their head into me while we’re reading stories, or randomly come up and hug my legs. I’m sure there will be a day when such open affection is rare. They crave affection. I’m always surprised with how delighted they are when I force tons of kisses and hugs on them. They’ll shout “No, Stop!” but their bright eyes and wide smiles makes it clear that they, like me, love to me shown they’re adored. Last week, we set up the toddler bed in Scotland’s room, thinking we’d give the shared room a try. It resulted in many late nights (full of fun for the boys) followed by days of emotional duress and conflict when their fatigue hit them. It didn’t take long to realize that, when other options were available, the shared bedroom wasn’t our thing. So, Saturday we took down the crib and moved the toddler bed into Anders room. The last few nights there has been much screaming and tantruming at the door by Anders- who fortunately can’t quite open the door if closed tightly. The length of these tantrums has grown shorter, and I was hopeful for tonight. As I’d hoped, his crying ended soon after it’d begun. I sat downstairs reading, and feeling smug that our transition was near complete. About 30 minutes later I hear “Mommy, Mommy?” in a low husky voice. At first I assume it’s Scotland, but no, it’s Anders. He crawls up on the rocking chair with me to watch the video I was watching on my phone about how our church helps refugees. Scotland came down a few moments later saying “I want to cuddle!” One on each side we sat snug under a blanket as I explained the sad predicament of millions of people, we pondered what we could do. Then I sent them back to bed. Scotland happily obliged, and fortunately, Anders followed suit. They walked upstairs, single file. I didn’t hear a peep or sound afterwards. Could they possibly have just gone back to their beds? After 15 minutes I came up to investigate. Anders door was closed, his bedside lamp shining under the door. I quietly opened the door to find his bed empty. I tiptoed down the hall to check if he was in bed with Scotland. Not in bed, but happily asleep on the floor near him. 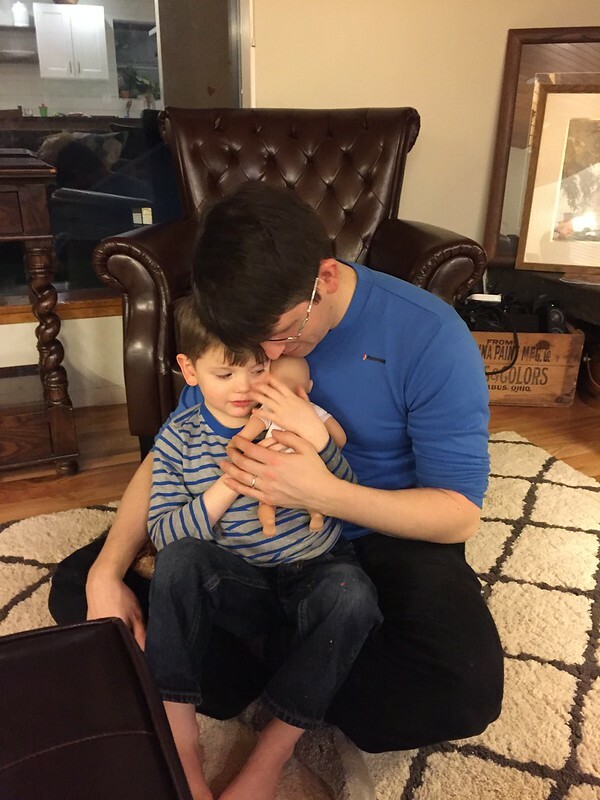 My heart warmed at the love of my two boys. They are the best of friends. Witnessing their sweet relationship is one of my favorite parts of motherhood. They may not be permanently sharing a room, but I secretly hope that there are many nights when they sneak in to cuddle up together.